The 40' cars are all Protocraft imports. Very nice models, with all of the proper details in place. The cars were painted with Trucolor paints at the clients request. A model paint which is actually an ink but goes on very well. The weathering was done with a mix of sprays, oils and PanPastels. I just finished a job for my friend, Jon Cagle, the owner and mastermind behind Southern Car & Foundry. I built 7 of his Standard Tank Car Co kits for him. One of each variation. His plan is to upgrade the SC&F website to better present his product line as well as to include the new 3 compartment tank cars, which I wrote about at the beginning of the year. Compared to some of the other resin tankcar kits out there, these kits are a treat to assemble. SC&F has thoughtfully included templates to assist with handrails and very well designed etched stirrups and other details. A lot of thought has gone into these kits and they deserve your attention. Was that Trevor delivered the 5 tobacco kilns that he built for me. He scratch built these for me after going out into the region and measuring some of the remaining kilns. I've said it before, and I'll say it again, this layout would not be what it is without the invaluable assistance from my friends. Thanks Trevor! Getting closer to being ready for Ops! Trevor Marshall came to visit today and help out with some tasks on the layout. First job was selecting the best locations for the Fast Clocks. We determined that with the layout configuration, that one in each of the 4 corners of the room would suffice. Operators will be able to view a clock with a small turn of the head from anywhere in the layout room. I had purchased 4 of these clocks and controller from GML Enterprises based upon a suggestion from Trevor. He'd bought some from them before and was very pleased. I prefer the look of these clocks over digital clocks. They look "railroady" and it is 1951 in my basement. Long before digital clocks were in vogue. The other major project was getting the train order board in Jarvis functional. At first I wasn't going to have functioning train order boards, but as I've been thinking about operations more and more, I've come to realize that they are essential. I'd already purchased train order boards from Tomar, and they offer an accessory for actuating the train order board itself. The unit is based upon a Tortoise slow motion machine with Circuitron linkages and a little electronics magic. I use a 3 position rotary switch to control the position of the train board. Once the fascia is painted, there will be labels for indicating which position is which along with eastbound vs westbound. No orders in both directions. Form 19 orders for the westbound. Form 19 orders for the eastbound. Form 31 orders for the eastbound. Form 31 orders for the westbound. It's starting to feel like a railroad down there! What is the life span of a compressor? Apparently, about 400 resin cars! After painting about 400 cars, my little compressor gave up the ghost today while I was painting some O scale brass cars for a client. Nothing like the telltale scent of burnt electrical devices and factory smoke rising from the internal workings to suggest to one that something is amiss. Fortunately there was enough air in the tank to allow me to finish the job and clean the air brush. And, bonus round, Canadian Tire was having a sale on compressors. $60.00 bought me a new, larger unit along with a throw away nail gun. Anybody want a nail gun? From our friends at Scenic Express, Silflor Goldenrod. Not cheap, but well worth the price. This is most of $25.00 box, painstakingly applied one clump at a time. I'm so very pleased that we can get all of the amazing textures and colours provided by Scenic Express. Surf their site. You'll be impressed. There was a brief dialogue today on Proto-Layouts Yahoo group about hand laid track and ballasting methodology. I thought I'd share some of my thoughts on the matter along with images. I chose to handlay for a number of reasons. Economy was one factor, but not a big one. Quality was certainly a big factor. The vast majority of commercial turnouts are poorly built. Out of gauge. And usually have large unsightly lumps of plastic for hinges and pivots, etc. And they are not DCC friendly without a lot of work. But arguably the biggest reason was ballasting. I've never been able to install commercial turnouts and then ballast the area without having issues with gluing the points shut. It's probably a shortcoming on my part but it is my reality. By handlaying I can ballast before the rail goes in thus eliminating the potential for trouble. 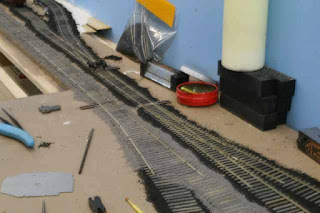 I used the Fast Tracks Twist Tie system throughout the layout and built the individual turnouts in place as I progressed along. 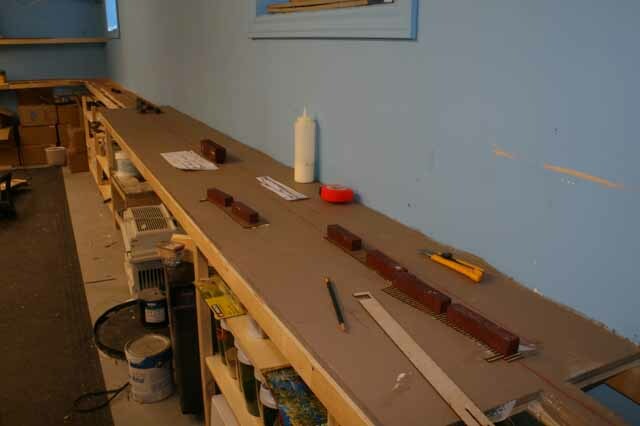 With the track centres drawn in, the switch ties strips are glued in place. I placed lengths of steel stock to weight things down while the glue dries. Then ties are laid down filling in between the switches. When that's secure, the tops are sanded and then all is stained. It is at this point that first pass with ballasting is done. As you can see I use light grey for the main and cinders for the secondary trackage. I can then build the turnouts in place using the various tools and jigs created by Fast Tracks. One of the neat aspects of the Twist Ties is that they come with holes drilled for spikes, which can really speed things up. Once the rail is down and wired, and tested,(Yes test now!) I paint the sides of the rails and move on to scenery. This an open field area that has had Sculptamold added to the area and then painted earth colour in preparation for various ground covers. As you can see the ballast is only really in place around the ties, the edges leave much to be desired. Once ground cover has progressed to a certain point, I can come back and refine the roadbed and the ballast. There's still lots to do in this area. Right of way fencing, telegraph poles, and lots more texture and colour. But I think you get the idea of how I approach the project. Well, you won't be hearing that from the guys operating on my layout. Following a lead from the Proto-layouts Yahoo Group, I've purchased a selection of fascia signs to indicate towns and car drop locations therein. The company is http://www.signomatic.com/, a Swedish outfit. The website is very user friendly and gives you an instant full size indication of the sign you're creating. Transactions are done in US dollars. Now I will caution Canadians, they currently cannot accept orders from Canada, but if you badger them enough maybe they'll modify their software. Or find a friend with a US address. Delivery was very quick and pricing is really good.